Smuggle Truck Game: Run for the Border 2.0? Fresh from our "We're not making this up" file, ColorLines is reporting that fledgling independent game developer Owlchemy Labs is releasing the game Smuggle Truck in March. Channing Kennedy believes that the game trivializes our current immigration policy. 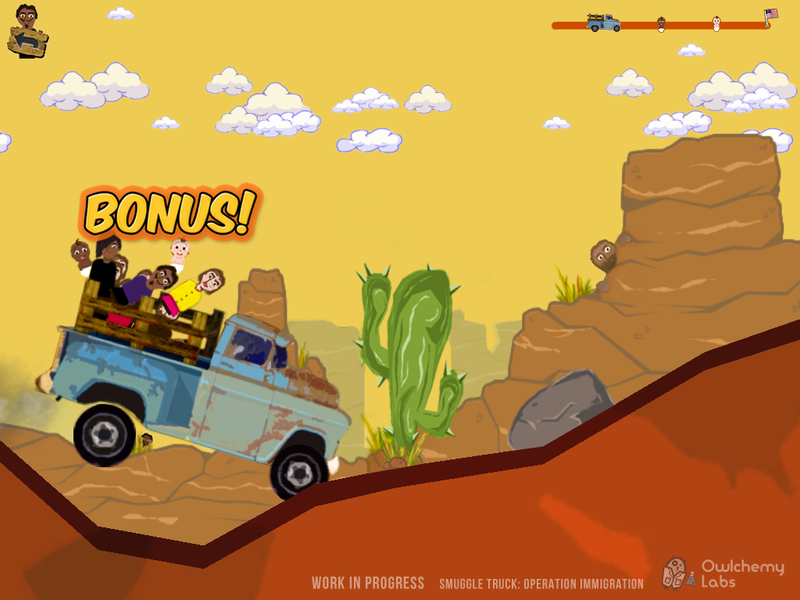 Kennedy says, "The player controls an old pickup truck crammed full of Latino caricatures, and attempts to drive across rocky terrain without too many people bouncing out. Every so often, a swaddled newborn baby shoots skyward out of the truck, indicating that an expectant mother has given birth. Like with "anchor babies"; get it? Players get points for catching a baby as it lands, but it's not required. Players complete levels by jumping over the border fence; as the border is crossed, the American flag is hoisted to fireworks, in an homage to Super Mario Brothers. Some say it's just a game and games can push boundaries." It might be funny if the Obama administration hadn't deported a record-breaking 393,000 people in 2010. Perhaps it would generate humor if a record 378 people had not died trying to cross the border from Mexico into the United States last year. It might cause a chuckle if enforcement and incarceration policies had not made the border a dangerous place for all involved, including authorities. The game appears to be a cultural shorthand for further demonizing a group of people that far too many Americans have labeled as undesirable. To play on that ideology is not a game — it's just plain sad. In other news: Say What? Michele Bachmann's Revisionist Musings.